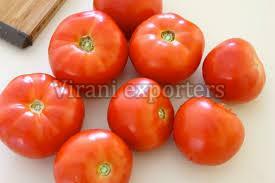 The supreme-quality Fresh Tomato, supplied by us, is acclaimed for its ideal size (6-8cm) and great taste. Our team members and quality auditors keep regular checks on the quality of products and thus, even the raw material used is tested under vigil supervision to ensure better quality products. Our entire range is made to go through to extreme quality control checks to make sure they adhere to standards of global management systems.